Too many pots on the fire? Yep. 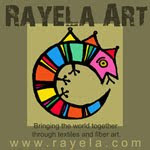 My other project, TAFA: The Textile and Fiber Art List is making a big transition to a state-of-the-art website. We are fund raising for this and I found myself unable to think of two big projects at once. is on hold until Fall of 2011. Meanwhile, if you have ideas or comments, please feel free to post them on this blog. There is a time for everything under the sun and The Sewing Project's time will surely come! 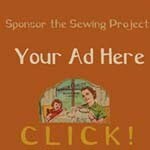 Introducing "The Sewing Project: Paducah women sewing for the web". 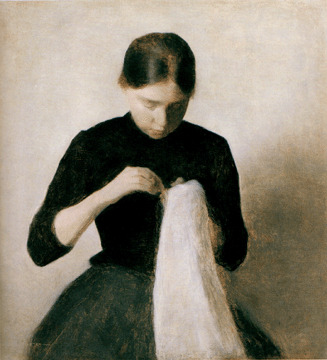 "Young Woman Sewing, The Artist's Sister Anna Hammerchøi,"
Sewing has been with us ever since we figured out how to use a sharp pointy thing with a hole in it and some kind of thread to stitch two pieces of leather together. A favorite subject for painters and other artists, those who sew are women in most cultures. Known as "Quilt City, USA", Paducah, Kentucky, has a long history with sewing. John Kleber documents some of the early history in Kentucky with quilting in his book, "The Kentucky Encyclopedia", but sewing has also been a part of the garment industry in this region. The Shakers had a large hemp operation in this area in the 1800's and until the 1970's there were quite a few mills that employed people, mostly women, in garment production. Today, Paducah hosts several key players in the quilt and fiber art scene. We have the American Quilter's Society based here, which hosts our annual quilt show and publishes magazines and books on quilting, The National Quilt Museum is a magnet that brings people off of the expressway that cuts through Paducah, bringing tourists daily to our downtown area, and there are many quilt related businesses around town. Within this culture of needle and thread, Paducah also has its share of poverty, distress and need for community economic development. The City has made great achievements in the past few years, but the reality for many of us is that there are few jobs outside of entry level retail or food service positions. 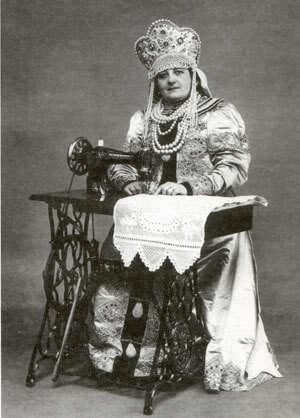 Vintage Singer ad with a woman in Russian costume. The Sewing Project seeks to provide one alternative to this mix, bringing together some of the local talent that is abundant here with women who may have not had much exposure to opportunities offered for income generation on the web. A two year program using sewing as a tool for understanding how products are made, how they compete in the market, and how they can be sold online promises to open new doors for the participants in ways they never imagined. They will see through hands on training how the computer can be a tool to reach out to the world at large. Even if they do not end up with a home business at the end of the program, The Sewing Project will give them new skills to make them more employable, along with a support system and a new community. As women who in the past sat around quilting together, their end product was a finished quilt, but the process was companionship, shared stories, and support. The Sewing Project intends to steal great ideas from other efforts around the world: fair trade groups, co-ops, non-governmental organizations, micro-enterprise efforts and anything that we find that uses a needle and thread to empower women via the cottage industry model. We will then take these ideas, implement them in ways that make sense to us, document them here on this blog as a public record and hope that others will like what we are doing and do something similar in their own communities. There is very little out there on the nitty gritty of how to set up a project like this and we will surely make changes as we experiment and learn about what does and does not work for us. We are committed to being transparent, open and sharing what we learn. Follow this blog, comment on it, ask questions, share your story, and be a part of the process, no matter where you live. We are all connected in some way and we hope that you will be a part of our community, whether it is local or virtual. Get new blog posts by email.